Your house will smell amazing with this Crock-Pot potato soup. The slow cooker makes this meal super-easy: Just dice a few fresh ingredients, pop ’em into the Crock-Pot, and wait for the magic to happen . . . It’s literally comfort in a bowl. I admit, that phrase seems cliché, but my mom’s Loaded Potato Soup is one of those cold-weather staples. It’s become a fast favorite for my girls. And even though I’ve made it for my family for years now, they still lovingly call it Grandma’s Homemade Potato Soup. While I love my mom’s potato soup recipe, I often don’t have the time to tend to it throughout the day the way she did. So . . .
Below is a variation of Grandma’s Homemade Potato Soup made simple for the Crock-Pot. Our family has slowly perfected it to be pretty darn close to the original taste — but with less work. Put the quartet of diced ingredients in your Crock-Pot, and let the broth flavors mingle and simmer for 6–8 hours. Add a super-simple roux an hour before serving to your baked potato soup to make it creamy-delicious. 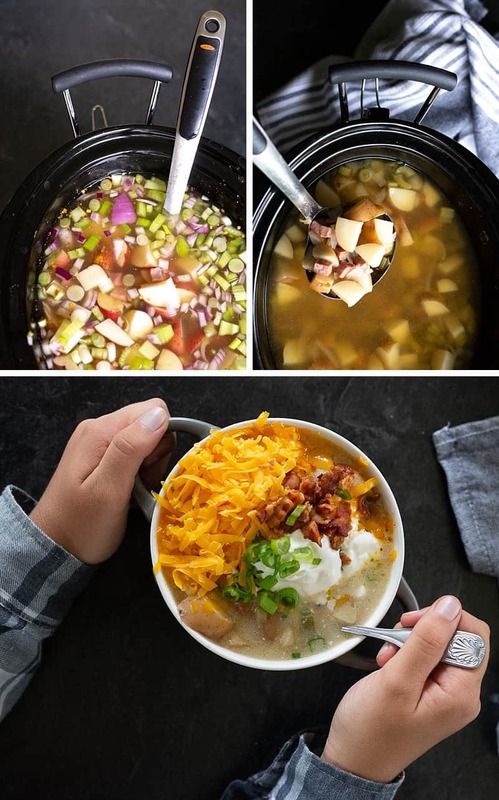 Enjoy this Crock-Pot soup with your family’s favorite loaded-baked-potato toppings — sour cream, cheddar cheese, bacon crumbles, and a colorful sprinkle of green onions. 1. 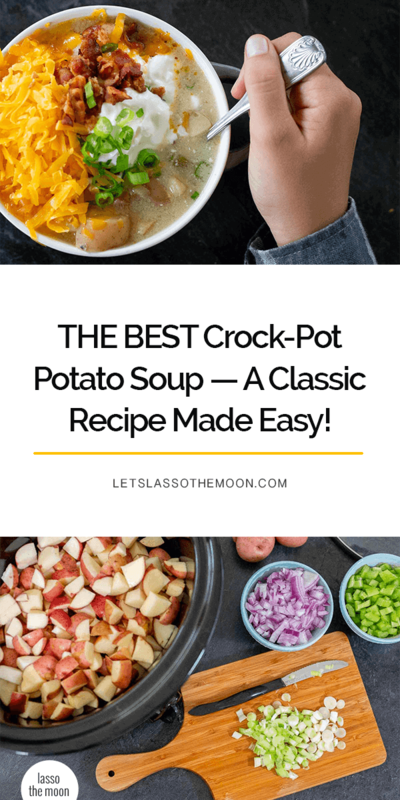 Slice, dice, and get that Crock-Pot potato soup simmering! The first step is simple, but it’s the most time-consuming part of making slow-cooker potato soup. I promise this homemade potato soup is worth it! Get your children involved when making homemade potato soup. It will save you time and, more importantly, it’s an excellent opportunity to bond with your kiddos. 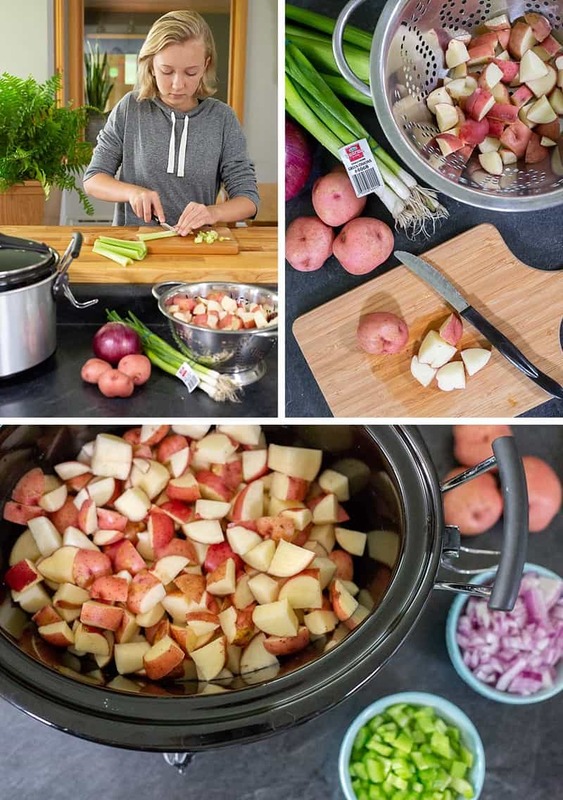 This easy Crock-Pot potato soup — with real hunks of potatoes — also has chopped celery and onions. Once you’ve got everything diced, it’s time to get this hearty, ham-and-potato soup a-cookin’! Start by adding your potatoes to the slow cooker. Next, add your chopped veggies and a package of hickory-smoked ham (or diced smoked slab bacon is AMAZING too) on top of the potatoes. Some seasoned salt and cracked black pepper mixed with a dash of cayenne pepper and a pinch of red pepper flakes give this recipe additional warmth. Finally, cover your base of ingredients with chicken broth and simmer on low for 6–8 hours. 2. Make a super-simple roux to thicken your slow-cooker potato soup. Grandma’s original stovetop potato soup recipe called for a deliciously indulgent butter-and-flour roux, but I use an alternative approach with my Crock-Pot potato soup . . .
About an hour before serving, turn your slow cooker on high. Warm 2 cups of milk either on the stovetop or in the microwave. Gradually whisk the flour into the milk until it’s smooth and lump-free. Stir your slow-cooker roux into your potato soup, and cook on high for an additional 30–60 minutes. If you decide that you’d like mashed potato soup instead, gently use a potato masher to mash your potatoes right in the slow cooker. (I’ve even heard of people using an immersion hand blender [A.K.A. stick blender] to cream together the ingredients to make a cream of potato soup.) Our family loves the big, hearty potato chunks, so I haven’t tried a mashed or creamed variation yet. Add more veggies! If we’ve already got it in the fridge, I add freshly chopped spinach to the recipe. Carrots can be a nice addition as well. Watching your sodium intake? Skip the hickory-smoked ham and seasoned salt, and switch to a low-sodium chicken broth. Many potato soup recipes call for heavy cream, which can be 30–40% butterfat. Consider making your soup recipe with a whole-milk–and–flour roux (like the one described above) in lieu of a high-fat cream. Or, instead of having a cream-based potato soup, skip the milk/cream altogether. This potato soup recipe is a hearty Crock-Pot dinner whether it’s creamy or served as a more traditional broth-base soup. Skip the suggested “loaded” serving toppings. Adding cheese and bacon to the top of this Crock-Pot potato soup *IS* yummy, but 100% optional. It’s still delicious all on its own! In a heavy cream, tons of butter, or bacon-and-cheese scenario, I’ll offer the kids apple slices as a pre-dinner snack or serve a good-sized salad BEFORE serving dinner. Which leads us to Step 3 . . . I love this potato soup recipe “as is,” and I like a healthy broth variation with spinach, too. 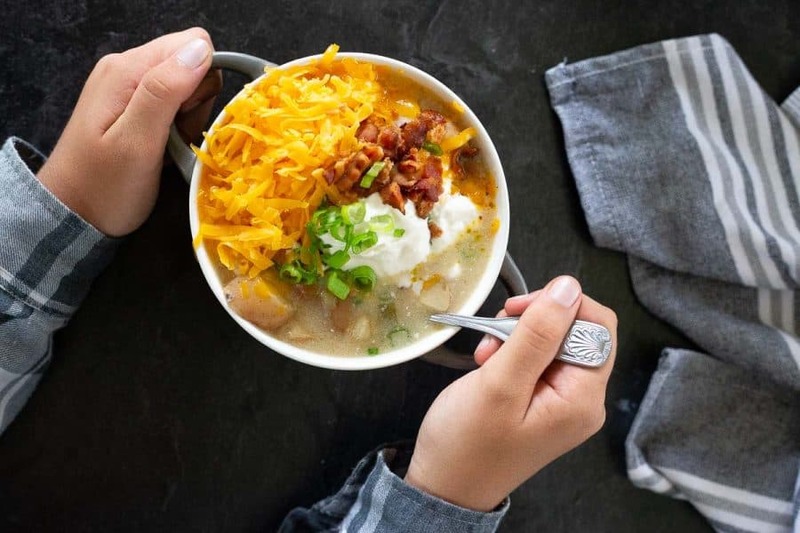 But on a dreary Wisconsin day, nothing’s better than a hot bowl of homemade potato soup topped with a dab of sour cream, some sharp cheddar cheese, and freshly-made bacon crumbles. Do your kids love to shred cheese as much as mine? No matter how colorful and enticing your ingredients look going into the Crock-Pot, once cooked, the recipe often ends up coming out a bit monochromatic. Add a dash of love to your slow-cooker dinner. ^ Don’t skip this final step! Are you ready to make this family favorite? Print the slow-cooker potato soup recipe below! Dice the red potatoes, the red or yellow onion, and the celery. Dice the green onion bulbs, then dice the green onion tops and reserve the green garnish for later. Add the potatoes to your slow cooker then top with the diced veggies, ham, spices, and chicken broth. Cook on low for 6–8 hours or on high for 4–6 hours. 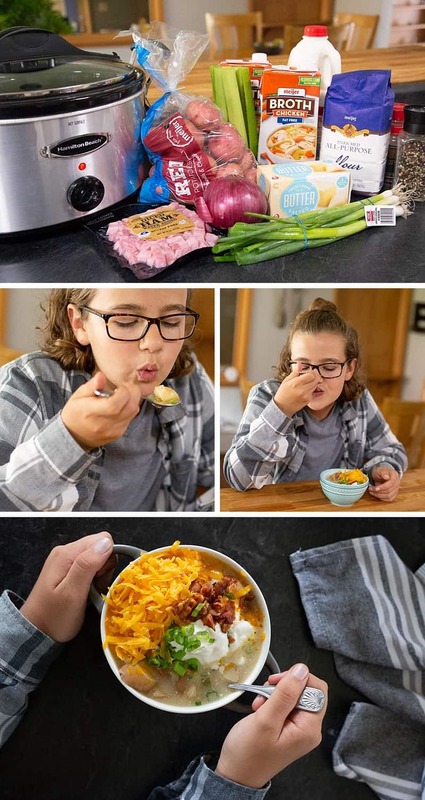 Serve this soon-to-be family favorite with some loaded baked potato toppings — sour cream, shredded cheddar cheese, and bacon crumbles topped with a dash of "love" (sprinkle on some chopped scallions). ENJOY! Pink Lady apples — They’re a unique compliment! Keep it simple. Leave the peels on when making this slow-cooker potato soup recipe. Red-potato soup is the best with this approach because the skins are so thin. Your family won’t even notice them after 8 hours in the Crock-Pot. Skip cutting potatoes altogether and use pre-cut diced potatoes from the refrigerated section of the grocery store. No time for chopping veggies? When you’re shopping, stop by Meijer’s prepared produce section and pick up a handy container of diced celery & onion. It couldn’t be EASIER — No peeling, no tears, and no scraps to compost. BAM. You’re done with the veggies. Want LOADED potato soup, but don’t have time to prep the fixin’s? Pop some fully cooked bacon in the mic or buy real bacon crumbles and pre-shredded cheese instead. Skip the frying and grating. No matter how far you’ve strayed from the town you grew up in, I bet there’s a recipe that reminds you of spending time in your childhood home . . . Working in the kitchen with my kids on Papa’s Ahh-mazing Crepes or on crisp German Potato Pancakes or Slow-Cooker Beef Stew with thick egg noodles like Grandma Gertrude used to make . . . it’s such a powerful, family-bonding experience for me and my girls. I love sharing our handed-down family recipes with you. Grandma’s Homemade Potato Soup is another one of our absolute favorites. It’s a MUST-HAVE fall staple at our house. I sure hope you enjoy it as much as we do — and that you find fun, little ways to make this recipe all your own! P.S. If you try the recipe, tag us on Instagram @letslassothemoon or use the hashtag #EasyPeasyFood so we can find it! I hope your kids like it as much as my girls do! « Are You Skipping This Important Step When Using The Slow Cooker?